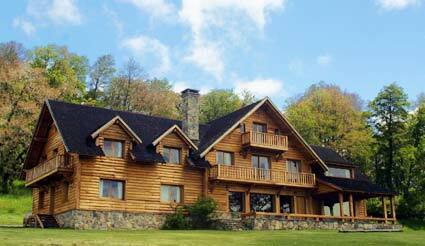 Why Choose to Stay in Lodge in a Lodge or Estancias? The answer is simple. 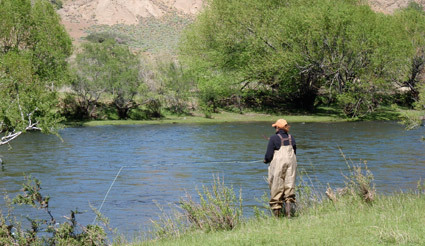 Private access to sections of rivers that have been carefully protected with fly fishing on a catch and release basis only, for many years; and where the chances of seeing other fishermen are very few. Enjoy all inclusive style service with perfect accommodation, regional and international cuisine, cool drinks and snacks after a day of superb fishing, all just a few minutes away from the lodge. Don't forget to make your reservations with anticipation. We recommend 6 months in advance. 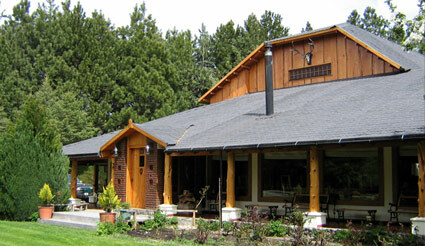 Estancia Río Quillén is 120 km North of San Martín de los Andes, inside National Park Lanín. 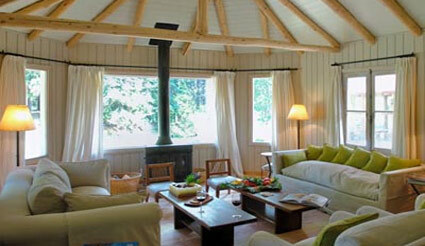 The Lodge has capacity for few guests, allowing personalised and exclusive service. Activities such as horse riding, trekking and mountain bike tours can be organised, all immersed in the incredible views of the River Quillén valley. 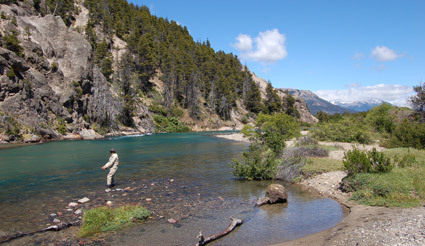 Quillén River is perfect for dry fly and nymph fishing. Beautiful browns and rainbows are found along 10 miles of private access, with a maximum of 8 fishers. It’s easy to wade due to its sandy bottom; and its structure is defined by cut banks, flats and riffles. 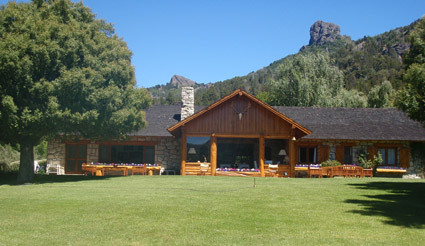 Located in Northern Patagonia, just an hour and a half away from Bariloche´s Airport, this estancia lies at the edge of one of the most beautiful rivers in the area, Traful River. 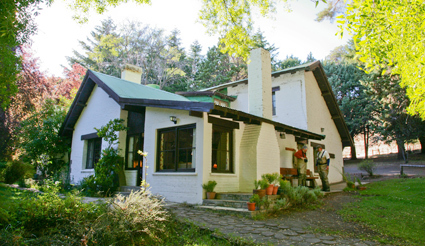 With spectacular views overlooking the valley, cypress forests and traditional wood and stone built houses set in beautifully landscaped gardens with mature trees, shrubs and colourful borders. The Lodge has few rooms of refined taste, and the quality of service prepared to receive the most demanding guests. For those not interested in fishing, the estancia offers the possibility of horse riding and trekking. Crystal waters, various rapids and pools surrounded by willows along 10 miles of private access, define Traful River. 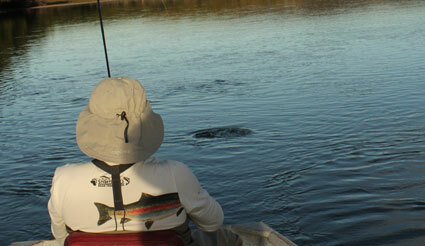 It´s one of the few rivers where you can find land locked salmon, apart from browns and rainbows. Just a few yards from the Malleo river banks, the lodge offers privacy, great accommodations and limited number of guests. Running as a Fishing-Hunting Lodge for many years alreay, managed by the owners (The Olsen family), it is without a doubt, the most famous Lodges in the area, providing great service, nice rooms with private bathrooms, perfect meals, bar with snack after fishing, and everything you need for un unforgettable fishing vacation. Private Access to approximately 20 miles of the Malleo river plus the Huaca Mamuil spring creek. World known as one of the finest destination for the dry fly fishing lovers , this river has just the perfect structure inside this property. It is easy wading on sandy or rocky bottoms, all the sections are accessed by internal roads without the need of long walks or drives, and hatches are very predictable. It is located one hour and twenty minutes from Chapelco Airport and is currently one of the few working estancias dedicated to raising cattle and sheep. It has a fishing lodge with cosy and confortable rooms, and a nearby bar where fishermen meet to read or share their experience. The estancia offers natural products including home-grown vegetables, meat and home-made bread. A friendly and dedicated service will make your stay unforgettable. 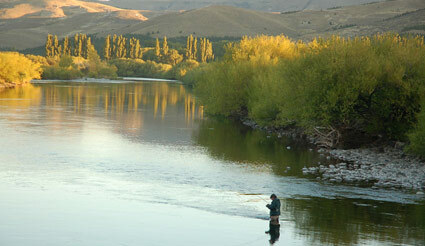 The estancia is surrounded by the Caleufu river, Collon Cura and Quemquemtreu rivers. We usually float different stretches of the Collon Cura river and wade through the Quemquemtreu river, a perfect environment for fly fishing, with its crystalline waters being home to the brown and rainbow trouts. Nearby, it is not unusual to see sheltered wildlife like guanacos, wild boars, and red deers. 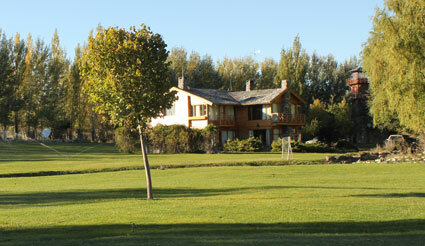 Located just a few minutes from Chapelco Airport, this estancia is one of the biggest of the area. A very limited number of guests will enjoy this great setup. Comfortable accomodations including spacious beautifull rooms, with in suite bathroom, living room, bar, dinning room with fire place, surrounded by the nicest landscape will make you feel at home during your stay. Gourmet style meals complemented with Argentinean red wines and first class service will add an extra touch. 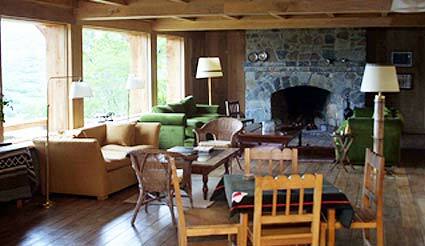 Private Access to aproximately 14km of the Chimehuin River plus about 7km of the Quilquihue river. Travel time through the estancia internal roads hardly exeeds 10 minutes! Located one hour Chapelco Airport and less than 2 hours a Bariloche Airport, Collon Cura Lodge offers private access to the best sections of this river. It is very practical and cozy, its simplicity makes it work just perfect. This Lodge offers 4 comfortable double rooms with private bathroom, sharing a small living room and can accommodate up to 8 people. Enjoy exquisite homemade dinners, regional snacks and picnics / lunches rivers with fresh vegetables from your own garden and a selection of Argentine wines. Satellite TV, PC, Internet (WI-FI) are part of the service. Collon Cura River is the biggest river around the area. 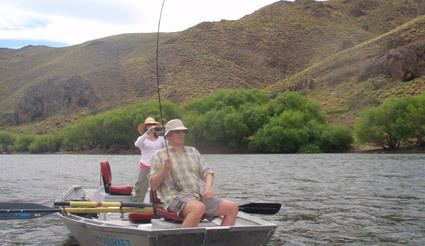 More than 25 miles of river, plus channels and lagoons, are accessible through the estancia where the lodge is situated. The access to the fishing areas is really fast and convenient using the paved provincial road and the ranch internal roads.